There’s clearly something about winter months, car launches and Malaga that go hand in hand. Almost exactly a year after Audi launched their new RS4 Avant in the Spanish sun; BMW put their spin on events with the launch of their new 8 Series Coupe. The 8 Series is BMW’s new super-premium coupe – seeing a return of the 8 Series badge after laying dormant for over 20 years. Promising luxury-a-plenty and supreme long distance comfort, it has all the right ingredients to be a MSF hit. 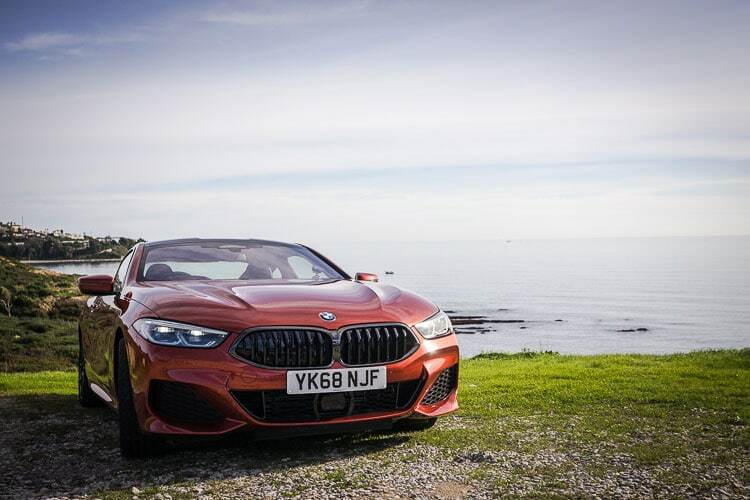 Interest is further piqued by the ‘M’ spec 850i launch model featuring a 4.4litre V8 engine motor; providing enough punch to propel the whole thing to 60mph in just 3.7 seconds. Occupying the top-tier of BMW’s line-up, it’ll come as little surprise that the £76,000+ 8-Series comes with a suitably premium interior; items usually reserved for option tick-boxes such as a leather dashboard come as standard, whilst the gearstick encompasses a Rolls Royce-esque, hand-cut prism glass centrepiece. Drop into the 8 Series and you’ll nestle straight into the seats; positionally they’re fantastic, they strike a good balance between supporting and feeling restrictive, there’s plenty of adjustment and naturally it’s all electronic (including the steering column). 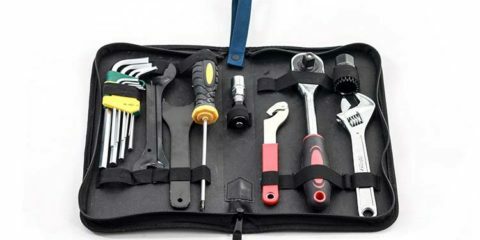 The only strange and notable omission is any form of massage function – for a premium long distance car you’d be within your rights to expect a little back-work whilst cruising. In terms of gadgetry, the 8 Series ushers in a new revision of BMW’s now renamed infotainment software; ‘iDrive 6’ has morphed into ‘Operating System 7’. Taking inspiration from the smartphone industry, plenty of new personalisation features have been pumped into the software along with some new security options. In testing, this was a little daunting – with so many options and controls it could be tricky to find the option you’re after. No doubt time would help in this regard, but a little simplifying wouldn’t go a miss. 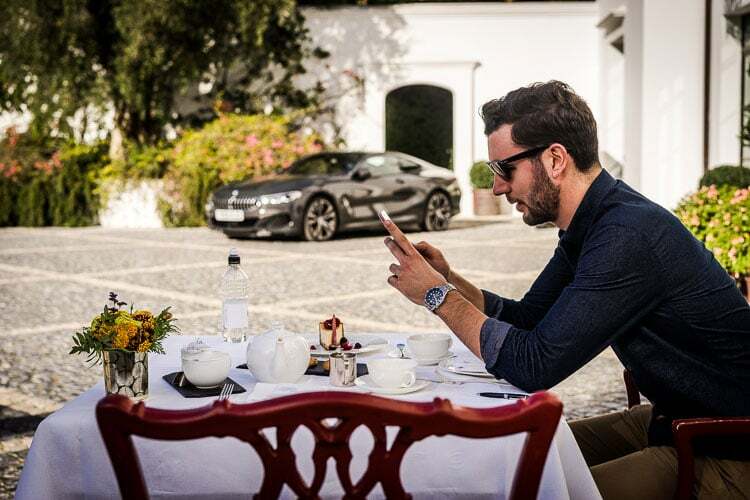 Going back to security; BMW’s keys continue to be a step ahead of the competition, with further software enhancements allowing you to use an Android phone to unlock and start the car – potentially a real game changer. 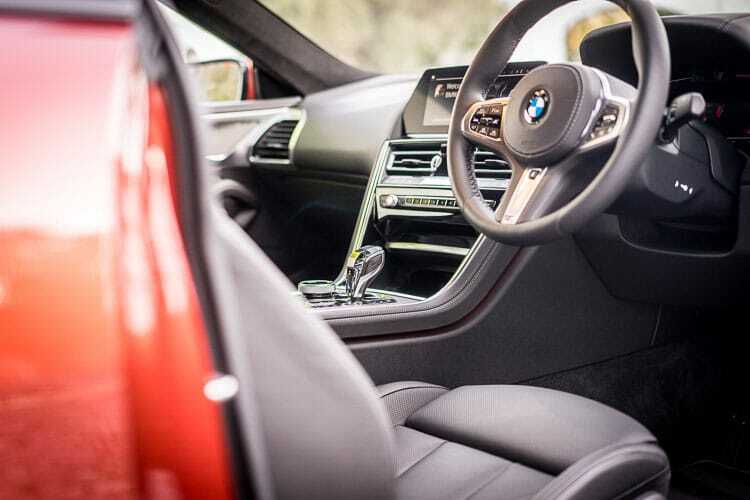 Despite BMW making a concerted effort to de-clutter the cabin, it still feels a little busy and overwhelming, with a central stack of buttons joined by a congested feeling steering wheel. The result of all these buttons is that interior fails to feel as ‘space age’ as the touch-screen heavy interiors of both Tesla & Audi. That said, the large central widescreen, coupled with the heads-up display and BMW live digital dashboard still make for very efficient information consumption. Boot space is all too easily compromised on Coupes, with their low rear-line encroaching heavily into luggage space. The 8 Series carries a decent 420 litres, with the low-lying boot stretching back for what seems like an eternity inside the car. Unfortunately, this does somewhat compromise rear passenger space, with leg room for the 2 rear seats reduced to essentially none with tall occupants up front – sorry kids! Lastly, we have the sound system. The 8 Series comes as standard with a Harmon Kardon stereo and to sum it up in a word; it’s sublime. Track after track, the system impressed throughout testing, showing up such incredible detail in tracks – I only wish I’d had more time to enjoy it. The crazy thing is, the HK stereo is ‘standard’ equipment, with a £4000 optional Bowers & Wilkins upgrade also available – nuts! BMW certainly haven’t followed the trend set by their German rivals when it comes to styling, with the 8 Series showing off a far more focused, aggressive and angular look than competitors offer. The roofline also takes inspiration from race cars of yesteryear, with ‘double bubble’ bulges creased in around the driver and passenger seats a nice touch – looking extra striking on those fitted with bare carbon roofs. Vents flank the sides of the 8 Series, sat just behind the standard fit 20” alloy wheels. The alloys are filled by the 8 Series’ impressive brake setup, with M Sport calipers on the test cars shown off to their full potential. There’s more vents and slats towards the rear of the vehicle, along with the two large, trapezoidal exhaust pipes. It’s disappointing to find these are simply imitation exhaust pipes which encapsulate the real item within, although considering the number of manufacturers now using this trend it’s not something BMW can be solely blamed for. There are currently two drivetrain options on the 8-Series, both receiving twin-turbo treatment; the 3.0 litre straight-six diesel 840d or the 850i – a barking 530hp 4.4litre V8. The diesel accelerates to 62mph in 4.9 seconds; impressive considering the 8 Series is just shy of the 2-ton mark, but this is smashed by the petrol’s ridiculous 3.7 second time. These fast 0-62mph times are no doubt aided by the rest of the drivetrain – BMW’s X-Drive 4-wheel drive system comes fitted with both engine configurations, as does the superb 8 speed automatic gearbox. Gear changes are struck with a magnificent balance of punch and smoothness, suiting the character of the car perfectly – bravo BMW. The X-Drive system can shift power as demands require – no fixed ratios mean up to 100% of the power can be made available to either the front or rear axle. Fire up the petrol and it produces a deep, aggressive, Mercedes AMG-like rumble. It’s an addictive sound which can only bring a smile to your face. Valves in the exhaust close off the noise and allow a little subtlety when required, although it’s certainly an engine that likes to be heard. For a diesel, the 840D also produces an impressive, refined note, with the metallic rattle of early-man diesel engines non-existent – I’d almost go as far as to say it sounds sporty… Did I really just say that about a diesel engine?! As expected, regardless of engine spec, the 8 Series is ludicrously fast in a straight line, hurtling you to the wrong side of speed limits in mere moments. Point it towards a bend though, and a few interesting and impressive things happen. 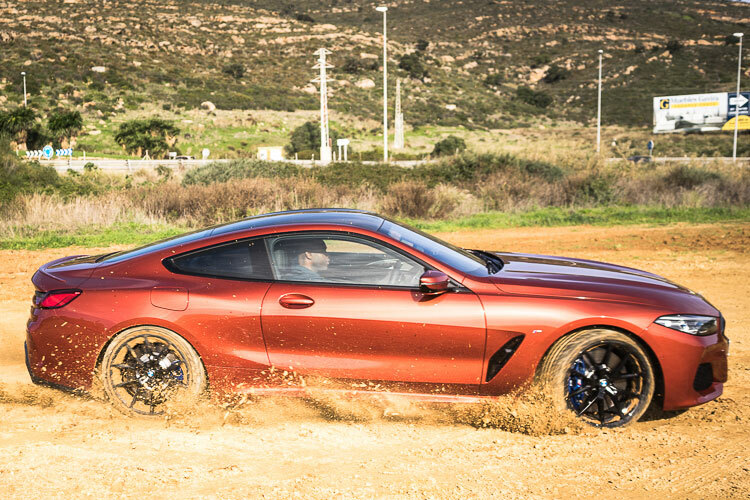 Firstly, lets discuss a few clever systems which the 8 Series has in its favour; X-Drive, Rear wheel steering & adaptive sports suspension (as standard), then in the case of the M850i; an M-Sport differential and active roll control on top. Quite a bit of tech then! All these systems work away in the background, optimising the cars handling to suit both the selected driving mode and the circumstances it currently finds itself in. 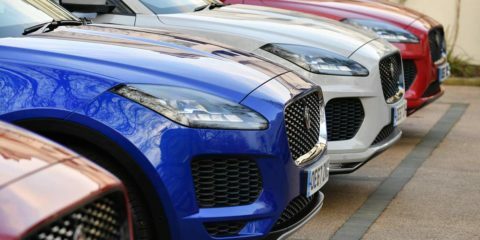 The result is cornering performance which belies the cars weight, making it feel considerably more nimble and precise than physics would normally allow. Despite all these systems, you still feel involved in the drive, making the 8 Series more fun than you might expect. Particular praise must be heaped on the rear-wheel steer system, which is nowhere near as intrusive and numbing to the steering feel as others I’ve tried. Adaptive dampers are fitted as standard too, so the sporty chassis feel doesn’t arrive to the total detriment of ride quality – although the 8 Series can’t match the silkiness of competitors in this class. Beyond the chassis, there’s also a whole raft of clever tech installed to make driving the 8 Series a more relaxing experience. Refinements you’d expect such as adaptive cruise, crash avoidance and lane assist are all present, along with BMW’s latest piece of trick tech – reverse assist. Reverse assist remembers the last 50 metres of your (forward) drive, then can ‘replay’ this in reverse on demand. Example scenarios include narrow driveways or country lanes, where re-tracing your steps facing the opposite way would normally involve a little nail-biting. On a car as big as the 8 Series, it’s a nice inclusion which worked superbly well when tested and should save customers a little neck ache down the line. 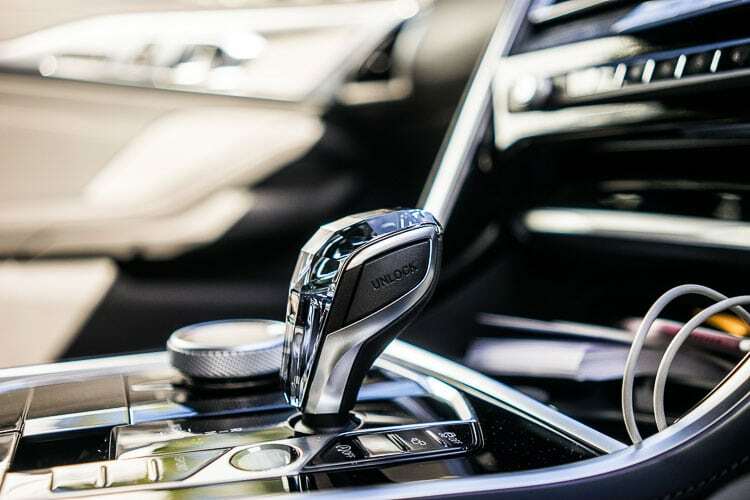 There’s a lot of technology crammed into all areas of the 8 Series – whether it be the new operating system 7 infotainment, the various chassis ride and comfort systems, the driver aids or the sophisticated new security options. BMW have come out all guns blazing for the relaunch of the 8 Series badge and the result is truly impressive. The level of refinement is truly commendable; fitment and feel are spot on throughout the car, the engines are superb and the gearbox suits the car impeccably. Yet, there’s something missing – the 8 Series in its entirety feels a little bit mixed, confused even. It’s a large premium coupe that’s trying a little too hard to be a sports car, with the result a car that’s accomplished at both tasks, but a master of neither. This is further hampered by the complexity of the infotainment system – we’re all for customisation, but the sheer level of options is overwhelming. Owning a BMW M3 myself, BMW are a brand I admire and know well. With well over 100,000 employees worldwide and a fine fleet of performance German vehicles, they’re certainly one of the industries big hitters so it’s fantastic to have them on-board with MSF. Thank you to BMW UK for inviting us along for the trip and giving us our first taste of the new 8 Series.